In 1971 Michael Jacobson, Ph.D., along with two other scientists, founded the Center for Science in the Public Interest (CSPI). The Center’s missions are to “conduct innovative research and advocacy programs in health and nutrition, and to provide consumers with current, useful information about their health and well-being.” Dr. Jacobson who holds a doctorate in microbiology from the Massachusetts Institute of Technology, has been the Center’s Executive Director for nearly four decades. He is now resigning this post to take on the role of Chief Scientist. He was one of the originators of the current food movement and is responsible for many nutrition advocacy programs including the campaign to put Nutrition Facts labels on packaged foods as well as finding and highlighting the nutrient content of movie theater popcorn as foods at Chinese, Italian, Mexican, and chain restaurants. While Dr. Jacobson and his organization are often referred to as the “food police” or “food nanny” — he moves on, knowing he’s fighting the good fight. I was able to conduct an email interview with Dr. Jacobson. Diet Detective: Michael, thank you so much for doing this interview. I guess the first question I would have for you is how and why did you started the Center for Science in the Public Interest (CSPI)? What was your motivation or trigger? Michael Jacobson: When I was in grad school in the late ’60s, Boston—and MIT in particular—was a hotbed of anti-war activities. After I got my Ph.D., I decided to postpone doing post-doctoral research for a year while I tried to find a way to use my scientific background to improve government policies and rein in corporate excesses. I ended up volunteering for a year with Ralph Nader and his Center for the Study of Responsive Law, and, by chance, I was told to write a book (Eater’s Digest) about food additives…and that evolved into concerns about nutrition (Nutrition Scoreboard). I liked the work so much that two other scientists and I decided to leave Nader and start a public-interest organization that would work on health and environmental issues and encourage other scientists to do the same. Diet Detective: CSPI has been called the food police. Do you wear that designation as a “badge” of honor, or do you have an issue with it? Can you please explain? Michael Jacobson: I chuckle at the term “food police,” but we see ourselves more as food detectives. We try to find and expose miscreant food marketers and then stop their abuses. Diet Detective: CSPI’s work has significantly impacted the food system–helping to reduce sodium in restaurants, decreasing junk food marketing to children, and leading the efforts to win passage of laws that require Nutrition Facts on packaged foods, to name a few. Is there a particular aspect of your work that you are particularly proud of? And what are your plans for the coming year? Michael Jacobson: On a general level, I’m proud that we at CSPI have always sought to base our opinions and positions on science. We don’t mindlessly follow “politically correct” positions (high-fructose corn syrup is worse than sugar; ingredients from genetically modified crops are dangerous; all additives are harmful, etc.). And we recognize that “the dose makes the poison.” More specifically, I’m proud that CSPI was the first to evaluate the evidence and then wage policy campaigns to ban partially hydrogenated vegetable oil (trans fat), ban unsafe food additives (Violet 1, sulfites, olestra, “mycoprotein,” etc. ), reduce sodium consumption, improve school foods, and reduce consumption of soda pop and sugar. We haven’t totally prevailed on all of those issues, but it’s remarkable how much of a difference our small organization has made. Diet Detective: We have a lot of scary nutrition issues facing us in the United States and the world. If you had to pick one issue to be most concerned about what would it be? Michael Jacobson: In the United States, salt. Cutting sodium consumption in half would save tens of thousands of lives per year in the United States. On the other hand, there has been no real progress on a more subtle issue: increasing consumption of fruits, vegetables, and whole grains. Globally, an enormous challenge is to halt the westernization of traditional diets, especially as the fast-food and soft-drink industries invest billions of dollars annually in low/middle-income countries. Diet Detective: CSPI has used litigation many times in order to achieve a food-system change and to force companies to behave in a certain way. Do you see litigation as an important tool for food policy advocates? Should it be used more often? Michael Jacobson: The courts provide a relatively fair venue to bring about change, unlike Congress and the executive branch, where political considerations so often carry the day. We’ve had good success in stopping unfair and deceptive marketing practices by such major companies as PepsiCo, Campbell, Sara Lee, Coca-Cola, and others. However, litigation is limited in that successes generally force changes by just one company and sometimes just one product or marketing practice. In contrast, laws and regulations affect entire industries. Sometimes, though, litigation against one or several companies can change broader industry practices. For instance, our threatened lawsuit against Kellogg for marketing junk foods to kids led not just to Kellogg’s improving its practices but to many other companies’ improving theirs as well. Diet Detective: From what I understand, one of your major sources of income for the nonprofit CSPI is from subscriptions to the Nutrition Action Healthletter (which, by the way, does an incredible job of moving the advocacy needle). As information transitions from print to the web and has been flowing so freely, how do you see food journalism changing and creating the kind of impact that CSPI has had in the past. Also, in terms of fundraising, how and what is the future for CSPI? Michael Jacobson: Thanks for your praise for Nutrition Action, which, indeed, has been a major source of revenue. But now that everything is moving to the Web, we are making changes, such as having a digital edition of Nutrition Action and starting a Website (NutritionAction.com) that enables people to receive a flow of emailed health tips (and “opportunities” to buy publications). We are also increasing our efforts to obtain foundation grants and philanthropic donations. Diet Detective: Do you have any thoughts about how social media can be used to influence food policy change and food advocacy? Is CSPI exploring ways to do this? Any examples? Michael Jacobson: CSPI certainly uses social media in particular and the Web more generally to press for change. For instance, our Change.org petition calling for Mars to stop using dyes in M&Ms contributed to their decision to begin replacing dyes in all of their foods with natural (or no) colorings. People who want to sue companies contact us via one of our listservs. Our ssb-listserv and sodium-listserv serve as great ways for activists concerned about sugar drinks and salt to communicate and coordinate activities. Diet Detective: There are several campaigns/videos/apps that stand out to me – The Real Bears video, which, by the way, makes me cry every time I show it to my students (my dad recently had his leg amputated because of diabetes); Food Day; the Chinese and movie-theater-popcorn investigations; and Chemical Cuisine. Can you share some of your future campaigns that are in a similar vein? Michael Jacobson: Sorry, but neither the FBI nor the food detectives talk about their ongoing investigations. Diet Detective: Who and what influenced your thoughts about food and the food system? Michael Jacobson: Grassroots activists and Ralph Nader taught me something about educating the public. Nader taught me some of the tools of the trade for influencing federal regulations, my scientific background keeps me focused on evidence, and litigators taught me the strengths and limits of lawsuits. Diet Detective: What is the one policy change at the local (or state or federal) level that you believe would have the greatest impact on health and food? Michael Jacobson: No one federal policy would revolutionize our diet, but some top priorities would include (a) limiting sodium levels in packaged foods, (b) limiting the sugar content in beverages or levying a stiff soda tax, (c) subsidizing the purchase of fruits and vegetables. I’m skeptical that the Trump administration and/or Republican Congress would do any of that, but public-health advocates certain should push at the local/state level for such things as soda taxes, warning notices on soft drinks, “high-sodium” icons for chain-restaurant meals, nutrition standards for kids meals at restaurants, and warning notices on foods made with artificial colorings. Policies at the local and state levels sometimes percolate up into national policies. Michael Jacobson: I think I detect what you’re driving at. Needless to say, I could tell you that we don’t have a single junk food on our premises! But that would be a lie. I think it’s perfectly fine for people to eat modest amounts of less-healthful foods—ranging from white-flour pasta to candy to ice cream—provided that their overall diet is rich in fruits, veggies, whole grains, seafood, nuts, and other more-healthful foods. So, yes, I confess to having ordinary pasta on our shelves, a few flavored (and plain) yogurts in our fridge, and lowfat ice cream in our freezer. 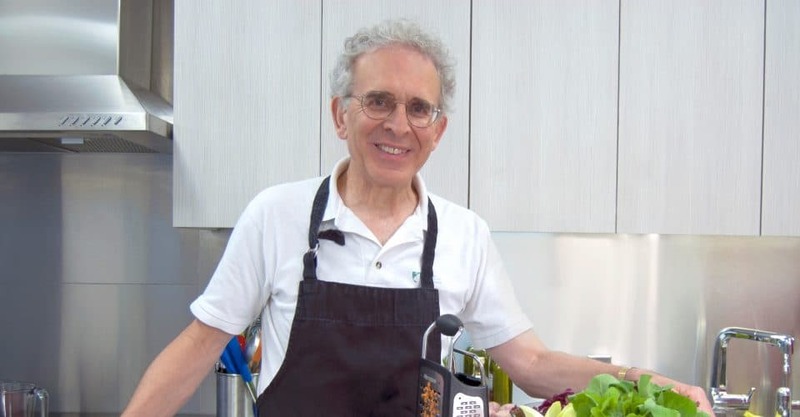 Michael Jacobson: homemade lentil-vegetable soup, grilled scallops on a bed of quinoa, a couple of fish tacos, a large serving of roasted cauliflower, a baked sweet potato, a handful of cashews, a big slice of watermelon, and a bowl of ice cream. Diet Detective: Calorie Menu Labeling? Social media and food policy website(s) you must follow/read: FoodNavigator, to find out what the industry is cooking up.